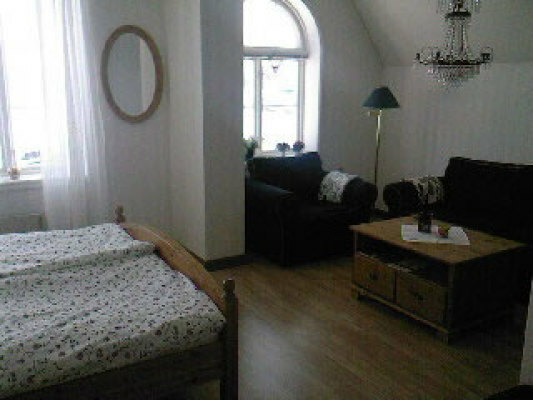 Flat Sweden, Härjedalen, Ytterhogdal: "Boende Ytterhogdal"
According to the owner you can here rent the most beautiful double room in the "Astoria" house, either week by week or on a day-by-day basis, and this exactly in the middle of Sweden. If you have overcome the distance from south Sweden to Ytterhogdal by car, it is hardly imaginable that Sweden has to offer once more the same lenght in pure nature. 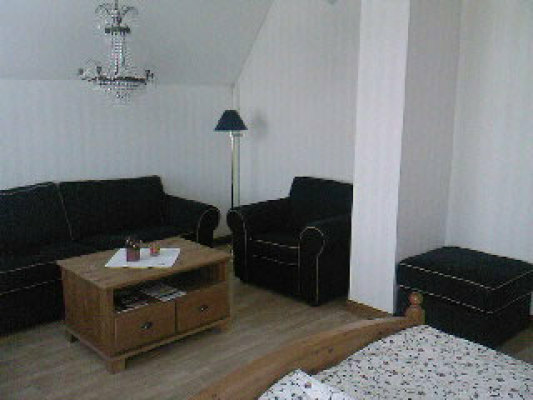 Your double room is furnished with a living-room suite,TV, DSL Internet as well as WC and shower. Also make use of the most beautiful view of the house towards the lake "Kyrksjön" and the river "Hoaån" from the balcony, belonging to the house. An outside corner seating unit with opportunity for barbecue is available. In case you will get hungry, a restaurant will be found in the same buildung. In summer you will be attracted by the place for bathing at the lake which is only 50 meters away, however, you can also go fishing there. In addition you need not roam around in order to bring along a little gift for the neighbor at home who takes care of your plants and flowers during your stay here. In the house gifts, products and delicacies, which are typical for this region, will be offered for buying. 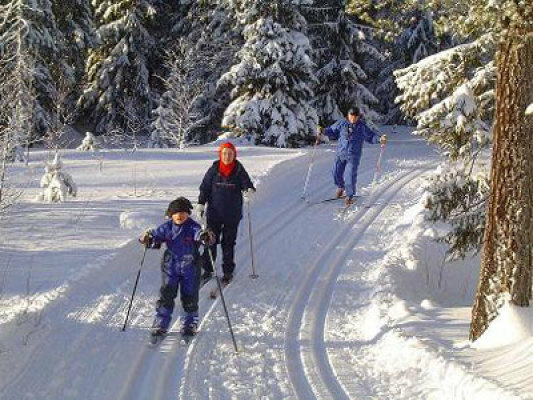 Ytterhogdal is located only 40 minutes away from the skiing areas of Klövsjö, Björnrike or Storhogna, in case cross-country skiing can not give you the real kick in winter. 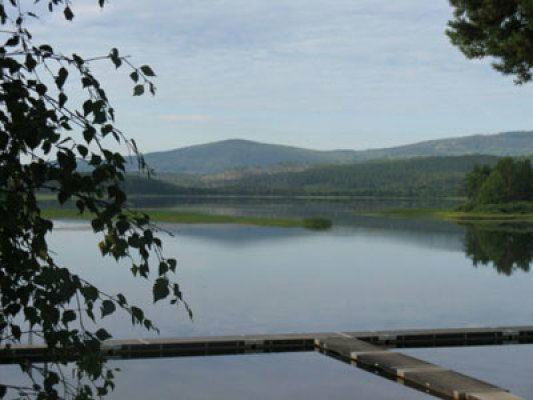 The largest place of Härjedalen, Sveg, is 45 kilometers away, but with a distance of 150 kilometers also Östersund in Jämtland is worth at least a day trip. 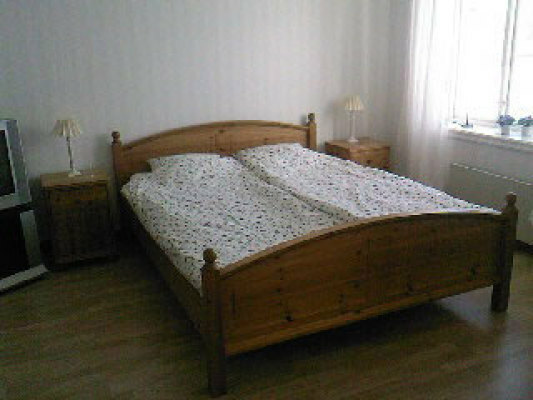 Bedroom with double bed + extra bed. A small boat with engine is included (gasoline not included). The final cleaning is included in the rental and will be done by the landlord. Radio, Bed linen/towelBed linen and towels are already included in the rental, Final cleanupThe final cleaning is included in the rental and will be done by the landlord. Härjedalen is a part of Jämtland County and borders to Norway, Dalarna and Hälsingland. Härjedalen is Sweden's smallest province in terms of population with only 10,500 inhabitants, of which 2600 live in the main village Sveg. The province is best known for its beautiful and wild nature with high mountains, vast forests, rivers and lakes. The province has both Sweden's highest road, Flatruet 975 meters above sea level, and the village Högvålen 830 meters above sea level. 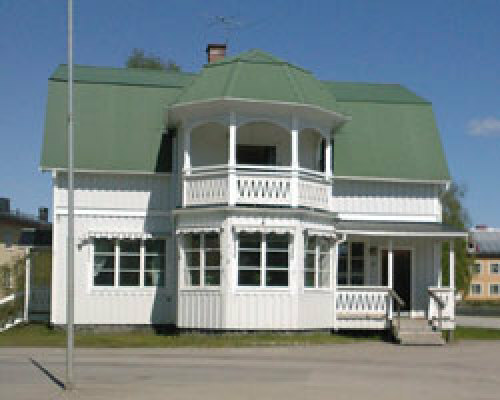 In average Härjedalen is located highest above sea level of the Swedish provinces. The most famous landmark in Härjedalen is the mountain Sonfjället. The mountain is also a national park and is one of the bear's richest areas in Sweden. The highest mountain is Helagsfjället, 1796 m, which also has its own glacier. 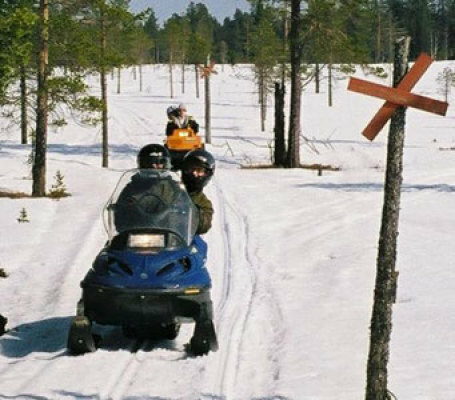 Härjedalen's tourism during summer time focuses on wilderness adventures such as fishing, hiking, trekking, hunting and during the winter time on skiing, ice fishing and snowmobiling. Much of the winter tourism is concentrated to the resorts Funäsdalen and Vemdalen. The most famous rivers are Ljusnan, Ljungan and Veman. Those, and hundreds of other streams and lakes, are home of the province fish, the greyling. 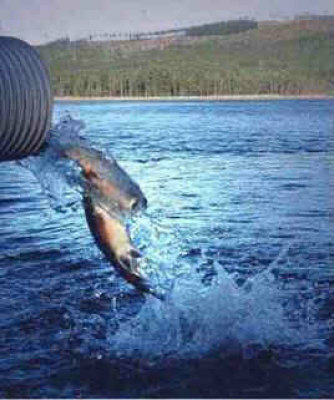 In the mountain lakes anglers can hope for actic char and trout and in the lowlands also for perch, pike and whitefish. Historically, this small province belonged to both Denmark, Norway and Sweden and the Middle Ages were characterized by changes in dominance, famine, disease and witch trials. Welcome to the country of graylings and mountains!